We can hear the train coming... bus schedules have been sent out, kids are getting antsy to see their friends, Target has restocked with school supplies.. a new year of school is coming! We thought we'd show you a few ways our family prepares on school days. 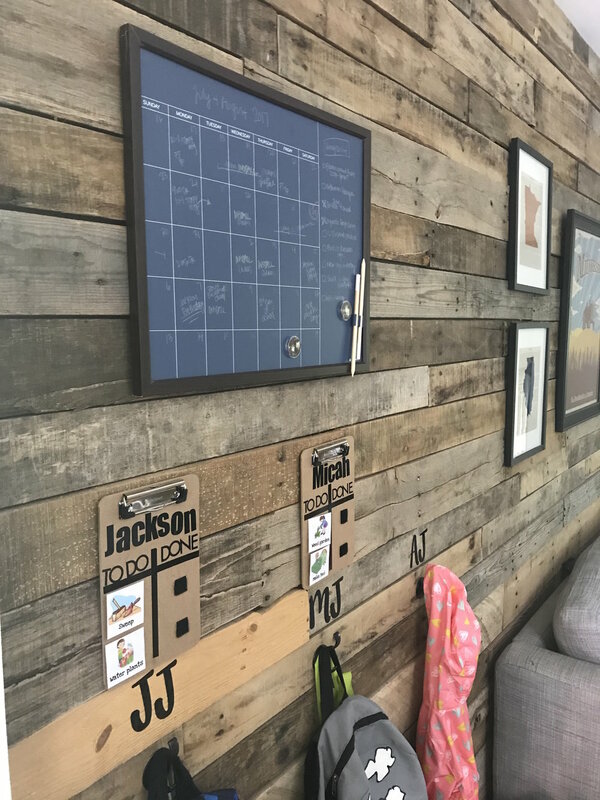 A large family calendar, chore charts, and book bag hooks for each kiddo. Every morning kids know where to find their backpacks and where to put them after school, there is also a basket for shoes under the hooks. It is also our kids responsibility to take their lunch boxes out of their bags and put them on the counter each day. Our two oldest (age 6 and 4), receive two chores they are to complete each day. The pictures are laminated and velcro onto the boards they made. When they have completed the chore they can move the picture to the DONE column. Mornings in our home can be hectic with 2 working parents. For efficiency, we pre-make all their lunches on Sunday nights. We have a drawer in our fridge with sandwiches and bags of carrots and fruit. We also have a draw dedicated to lunches and snacks (applesauce, chip bags, granola bars, fruit snacks), it's all right there and easy to grab in the morning. These are our favorite napkins for lunches! You can write little notes to your kiddos on them to let them know you're thinking about their day. Maybe it was just kindergarten but our children are coming home with artwork everyday. They are allowed to pick their favorite art to be displayed on the art wall in our living room.